A challenging hike with the Korkers Snowmageddon Boots and a following review. A thin sheet of ice and snow covered the winding mountain road to the trailhead. In the backseat alongside my pack, a new pair of Korkers Snowmageddon Boots were ready for the trail. As I pulled off to park, I was pleased to see no other cars. I would have the forest and alpine mountainside to myself, at least for a while. As I lowered my tailgate, I swapped my shoes for the Korkers Boots and laced them up tightly. Slinging my pack over my back, I headed up the snow covered trail ready for a challenging hike at altitude. In Colorado it’s common to encounter snow packed trails through the winter and into the spring, and this particular trail is one of the trickiest I’ve encountered. The area experiences more snowfall on average than other areas nearby, so much so that I believe it to be a micro climate. Much of the trail is covered by thick pine forest and receives very little sunlight in winter, which essentially turns the packed trail to ice. Having hiked it before, the trail is more like a slip and slide than a mountain route in parts. Before I hit the trail, I immediately swapped out the Korkers SnowTrac Soles for the IceTrac Soles with carbide lugs in a proprietary Korkers system known as OmniTrax Interchangeable Soles. I knew I would need this added grip right away on the trail. This said, I made sure to stow the SnowTrac Soles in my pack for that later sections of the trail. Much to my surprise, the Snowmageddon Boots gripped even better into the icy trail than I had initially expected. As I became confident with their performance, I even picked up the pace, something I wouldn’t normally do on a trail such as this for fear of slipping and pulling something. On the way up I never lost traction once (true story), something I’ve never experienced before. While the first part of this trail is deep packed snow, the trail conditions changed quite a bit as I arrived at the tree line. Gone are the deep snow drifts and heavy pack snow to be replaced with thinner, icy snow subjected to countless melt and thaw cycles on the exposed mountaintop. Here again I felt confident in the abilities of the IceTrac Lug and was not disappointed. Even in sheer ice sections of the trail, I was able to ascend with no loss of traction. I had finally found a winter boot I could trust on difficult trails. The final section of the trail is a quick scramble up a rock face to the summit, and the view never disappoints me. At almost 12,000ft. the culmination of this trail presents a majestic view of the continental divide. To complete this section and reduce any wear on the carbide lugs, I switched back to the SnowTrac Soles, which took less than a minute. I then carefully bouldered up to the overlook satisfied with how easy the hike was in the Korkers boots. All good gear tells a story, and that of the Korkers Snowmageddon Boot is an especially appealing one for me. For years I struggled to find the perfect winter boot for Colorado. Often I would just repurpose my summer boots and end up with cold feet or snow packed between my socks and soles. When it came to traction, many boots simply don’t perform well in packed snow and especially ice as I detailed above. Korkers Boots like the Snowmageddon are, on the other hand winter-specific. You won’t want to wear these on a summer hike, and for the warm seasons they will stay in your closet. But when the temperatures dip and the snow falls, these boots will be your go-to solution for any winter work or play. Of course the OmniTrax Interchangeable Sole System is a big highlight of Korkers winter boots, and they are remarkably easy to swap out. 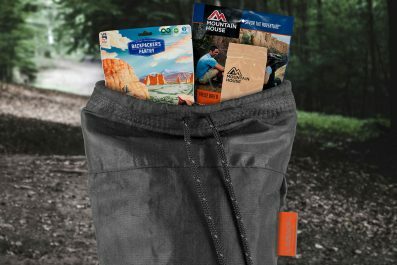 If you’re worried about the interchangeable soles coming loose while hiking, it’s a non-issue. Korkers has devised an easy way to keep everything in place until you consciously want to remove them. In this way Korkers has a huge advantage over crampons and ice cleats that sometimes don’t quite fit on your boots the way you desire or come loose after substantial hiking. Truly the boots feel like one piece until you release the catch on the back of the boot and pull the outsole free. The whole removal action is extremely easy to do, simply unlatch the back strap that secures the outsole, pull the outsole free from three key attachment points, and remove it from a securing slot in the toe of the boot. Inserting a different outsole is the same action in reverse, and with a little pressure the outsole easily locks back into the attachment points. Not to be overlooked, the Snowmageddon’s insulation and complete waterproof performance are an equally big part of the boot’s capability. While other Korkers models like the Polar Vortex 1200 offer 1200g of insulation, the Snowmageddon offers a breezier 400g. Speaking from experience, 400g is the perfect amount for activities like hiking. Even while I had to shed top layers during the intense part of a hike, my feet always felt comfortable and sweat free. The waterproof performance of the Snowmageddon is equally impressive, and melted snow started to bead off the boot leather moments after I stepped through any deep snow drift. Complete waterproof performance is a welcome addition to any boot, but in a snow boot it is a must. The Snowmageddon has no weak points in its design, and so even when the snow drift is nine inches deep or more (the height of the boot), the only vulnerable area is the top of the boot. When used with gaiters, you could tackle some pretty deep snow without any discomfort of snow seeping into your boot. Available Sizes: 8-14 with half sizes in 9.5, 10.5 and 11.5. Soles: Korkers OmniTrax 3.0 Interchangeable Sole System easily removed and swapped in the field. Boots include SnowTrac Winter Rubber Lug and IceTrac Studded Rubber Lug w/ carbide studs. Insulation: 400g of 3M Thinsulate insulation for active winter pursuits like hiking and snowshoeing. Waterproof Features: The boot is built for 100% waterproof performance from top to bottom including waterproof leather, webbing, and stitching. The interior bootie is both waterproof and breathable for added protection. Support: A 360° rand provides flexible support even in challenging terrain. In addition, the boot offers a generous footbox to accommodate most foot types. I’ve tested the Korkers Snowmageddon Boots in a variety of situations including the hike I detailed in the first part of this article, and I’ve always been pleased with the performance. Other terrains I’ve tackled with the Snowmageddon include deep, drifting snow and light, melted snow resulting from a warm spell in the winter. The Snowmageddon is equally suited for each environment, and if the trail only has snow in parts, you can use the SnowTrac on rocky terrain as well as snow. While the Korker Snowmageddon Boots aren’t exactly as agile as approach shoes, the are still remarkably easy to hike in, even in deeper snow. In addition, the boot is big enough for sock layering in colder environments, and the generous outsole offers plenty of traction in icy terrain. The OmniTrax outsole system is easy enough for anyone to use, and more importantly it can be swapped out in the field, even with cold hands. 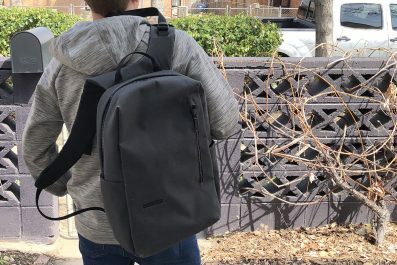 The extra outsoles are easy to pack, and depending on the model, they weigh next to nothing and fit in a day pack without taking up much space. (Note additional soles sold separately like the Korkers Triple Threat Ice Claw Bar Soles do weigh a little bit more due to a heavy duty design). As for break in period, the Korkers Snowmageddon Boots do come a little stiff from the factory, but even after just one long hike, they already started to feel more agile. By the time I set off on the longer hike detailed in the beginning of this article, the boots felt very natural to wear. Also given the nine inch height of these boots, I experienced very little fatigue even after a long, strenuous day of hiking. Korkers offers winter boot models unlike anything else on the market, and anyone who regularly encounters snow and ice in the winter should consider adding their boots to their winter gear collection. The Korkers Snowmageddon Boot is a great option for those that like to stay active in the winter. This model is equally suited for work or play, and it fits well during long snow shoveling tasks or a hike in the snow. Of course, it is my opinion that a “perfect” piece of gear has yet to be created, and if you disagree, be sure to leave a comment with your argument below. In the case of the Snowmageddon, I felt like the standard laces were a little short in length (especially when tucking pants into the boot for heavy snow), and the laces may suffer durability issues after long term use. Still, this is such a minor issue it’s almost not even worth noting. 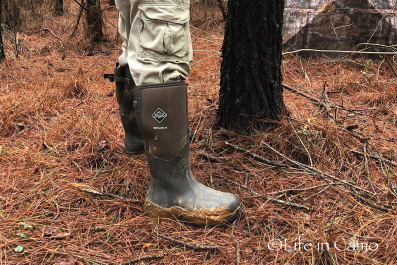 The Korkers Boot system succeeds in every way advertised, and I must say I’m very pleased with how they function in the field after my testing period. I look forward to adding additional sole types to the boot down the line, and I expect these boots to last for years to come due to the interchangeable sole concept. Best of all, I have finally found a solution to my winter / snow boot search that truly offers traction I can trust. One other note, if you like the unique design of the Korkers winter line and spend a lot of time in rivers fly fishing, check out their summer boot line like the Korkers Devils Canyon Wading Boot.